This active series of team games will put the partygoers’ swashbuckling skills to work! 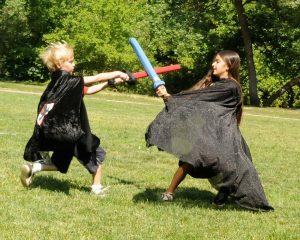 Children and guests wield one of our safe, foam Swasher swords and axes to duel against each other in fun, structured games, designed to allow children to explore sword dueling in a safe, constructive atmosphere. One such activity is a capture the flag game called Dwarves and Goblins. There are no puzzles or maps in this party, but participants are encouraged to strategize and plan the best way to accomplish sometimes daunting odds. 45 minutes: $120. 1 hour: $140. Up to 20 children.